Glen Wesley was such a steady defensive force on the ice, such a calming influence in the locker room for so many years with the Carolina Hurricanes few fans remember just how controversial his trade to the franchise was back in 1994. “There was a lot more to that trade than probably just the player,” general manager Jim Rutherford said. The dynamics of the trade for Wesley was felt on many fronts, its validity and value questioned from numerous hockey experts, by crazed hockey fans from two neighboring New England states – even in the political arena. Rutherford was at a party soon after trading for Wesley when Connecticut Gov. Lowell Weicker approached the Hartford Whalers’ GM with his own two cents about the deal. The “old experienced guy” Weicker was referring to was longtime Boston general manager Harry Sinden, known across the hockey world for his tight wallet and keen mind for talent. Peter Karmanos had just purchased the Hartford Whalers -- the bitter backyard rival of the Bruins – and the freshly-hired Rutherford selected Jeff O’Neill with his initial first-round draft pick. 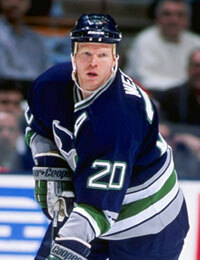 Soon thereafter, he traded for Wesley, who cost the Whalers three No. 1 draft picks (1995-97) – at the time a high price to pay for a defenseman whose major claim to fame was playing alongside future Hall of Famer Raymond Bourque. Sure, Wesley had scored 19 goals in a season and posted two 50-plus point years in seven seasons in Beantown, but many questioned whether the Red Deer native was worth three top picks. The first-round draft picks Boston selected in the Wesley trade were Kyle McLaren, Jonathan Aitken and Sergei Samsonov. McLaren played seven seasons for the Bruins and made the NHL All-Rookie team in 1996, but was injury prone and traded to San Jose after a contract dispute with Boston in the 2002-03 season. Aitken played just three games with Boston and 44 NHL games total, netting one career assist, while Samsonov won the Calder Memorial Trophy in 1998 as the NHL rookie of the year, had four 20-goal seasons for the Bruins and was later traded to Edmonton in 2005. In a bit of irony, Samsonov was picked up by Carolina last season and now plays on the team’s top line. 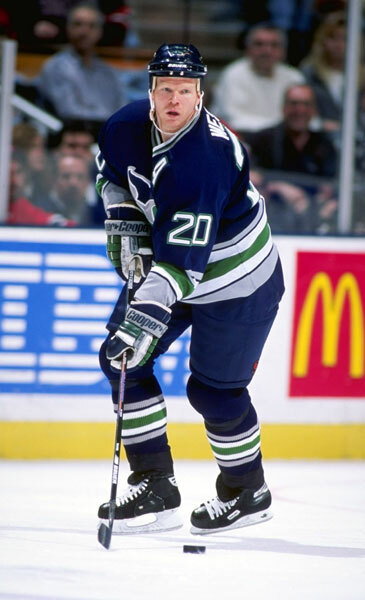 Despite being dealt from a team he broke into the league with as a 19-year-old, Wesley welcomed the trade to the Whalers, who at the time were a struggling franchise in search of a winning formula. Wesley’s role changed once with the Whalers and later with the Carolina Hurricanes, becoming a shut-down defender and top-notch penalty killer. He never reached lofty offensive numbers with the Canes, but won a Stanley Cup in 2006 and played in another one in ’02. In the end, if you’re judging the blockbuster trade, the edge goes to Rutherford, considering Wesley played 20 NHL seasons, logged 1,457 games, scored 537 points and has a possible Hall of Fame election waiting in the wings.